Despite my jokey post title, fish stew really is an elegant dish. Much more so than even the most sophisticated beef stew. The light flavor of white fish is perfect paired with a multitude of other flavors, many of which would otherwise be lost in the depths of a rich, meaty broth. 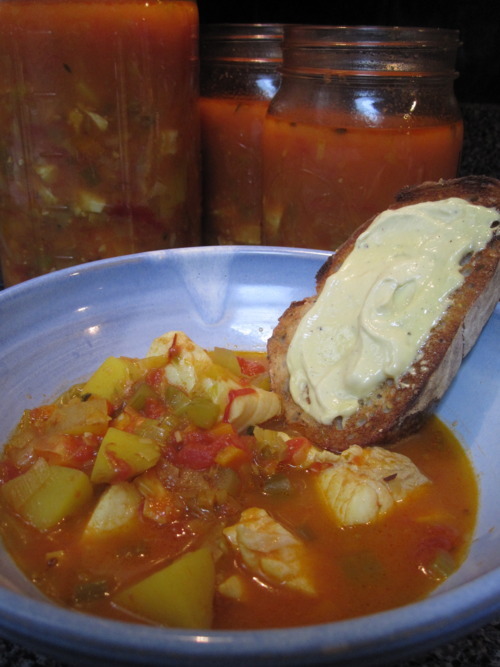 This stew is based loosely on the classic fish soup of Provence, la bourride, and prominently features anise seed, orange peel, saffron, thyme, and bay leaf. These delicate flavors are enhanced with a spoonful of rich aioli, a garlic flavored mayonnaise that takes just a few minutes to whip up. 1 28 oz. can whole peeled tomatoes, broken up into manageable chunks in a ziploc bag. In a large stockpot, warm the butter over medium heat and add the leeks, celery, carrot, and garlic. Season with salt and sweat the vegetable for 5-7 minutes, or until they are very soft. Stir regularly and monitor the heat so that the vegetables do not brown. Add the anise seeds and the wine and increase the heat, bring to a simmer and cook about 5 minutes more to evaporate some of the alcohol. Add the tomatoes, fish stock, bay leaf, thyme, saffron, orange zest, and the potatoes. Bring again to a simmer and cook for about 30 minutes, or until the potatoes are very tender. Stir in you halibut chunks and simmer only until they are just cooked through, no more than 5 minutes. Season to taste with salt (you will need a good quantity more to compensate for the unseasoned potatoes and fish) and serve each bowl with a spoonful of roasted garlic aioli and a slice of toasted rustic bread. This recipe makes enough stew to feed 6-8 people. Be sure to quickly cool any that is left uneaten, and it will be even better the next day. Squeeze the garlic cloves from their papery skin and place in the food processor. Add the egg yolks, lemon and salt and process until well mixed. Measure the olive oil into a measuring cup with a spout, and pour into the feed tube of the food processor with the machine running, in a slow and steady stream. It should take about one minute to add all of the oil. The mixture will emulsify and look like mayonnaise. If it seems too thick, add the warm water, again with the machine running, until it reaches a more desirable consistency. Refrigerate immediately if not serving right away. *To roast a head of garlic, preheat the oven to 350 degrees. Cut of the very top of the head to expose the cloves. Place on a square of foil and drizzle with about 2 tsp. of olive oil. Wrap the foil up around the garlic and place in the oven. Roast for 40-50 minutes or until the cloves are soft and lightly golden brown. Cool for at least one hour before handling. This entry was posted in gluten free, perfect health diet, seafood, soup and tagged aioli, gluten free, la bourride, perfect health diet, seafood, soup, stew. Bookmark the permalink.